Brawny Movers is a London, Ontario moving company that only employs quality movers in order to provide a better moving service. Our moving company actively services London, Ontario including all 42 districts/neighbourhoods and the surrounding area. Our movers are strong, friendly, in their twenties and attend(ed) Western University – making them more than just brawn. As an added bonus, NONE of our movers smoke so customers will never pay for smoke breaks. We started out as a labour-only service (“You rent a truck, we provide the muscle”) for those looking to save on moving expenses by renting a Uhaul then hiring our movers to load and unload their vehicle. You can still hire our movers for the labour-only service and we proudly boast the strongest movers in London, Ontario. This Labour-Only service saves customers hundreds to thousands of dollars compared to traditional moving services. Read our Self Move Guide and Case Studies for more information *Coming soon! We are the first London, Ontario moving company to allow customers to conveniently book movers through our website and while multiple competitors have tried to adapt our labour-only service, they lack what makes Brawny Movers the best: our staff. Demand grew quickly as one of our core principles (the highest quality staffing) led to referrals and some people preferred traditional business model – so we expanded! We can now offer multiple 2014-2016 model vehicles to fit various customer delivery and moving requirements. Please note: Our only vehicle limitation is that we do not haul any junk or refuse. While competitors may offer junk removal for an additional service offering, we are not comfortable transporting refuse in the same vehicles that transport furniture and other belongings worth thousands of dollars. Hire our movers as moving helpers to load or unload your vehicle. We can also do “micro-moves” where we help move furniture on your property. Residential Moves 1,2,3 bedroom apartments. Western and Fanshawe student moves. Local house moves and throughout Ontario. Commercial Moves Offices, warehouses and related equipment. Furniture Assembly Our Ikea furniture assembly service helps prevent headaches. Deliveries We can deliver items such as furniture, gun safes and are expanding for more. We are ideal for Western University student moves since our full staff consists of current WesternU students or recent graduates and are often familiar with student apartment buildings in London, Ontario. That said, we have done a fair share of Fanshawe student moves as well. We always recommend that whenever looking for any movers, make sure that they have a website, reviews and insurance. Since you’re on our website, you can find reviews here, on our Facebook page and on our MovingHelp profile. If you’d like to see our insurance, we will gladly bring you a copy. Our friendly, strong and non-smoking movers look forward to helping with your next move to/from/within London, Ontario. 1. We're insured [WSIB + liability & cargo]. 2. High quality staff - including 3 CFL players! 5. Support a local business. 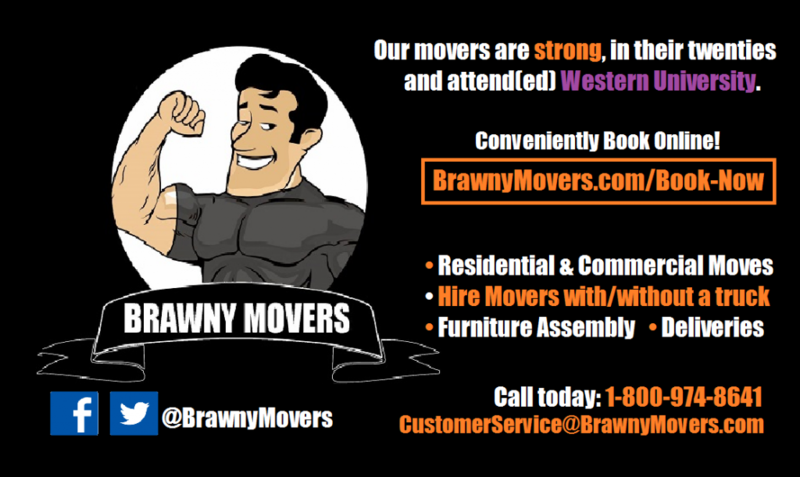 Why should I hire Brawny Movers?